The benefit of changing imei could range from benefitting from a promo, using browsing tweaks e.g. using glo bis on android, etc. Claimer/Disclaimer: please note that changing imei is considered illegal in some countries. Hence, the author of this this post is not liable to any damage done. It will open the phone's secret vault. Now migrate to 'CDS Information' under 'Connectivity'. To get there, you slide across on some phones while you slide down on some other phones. 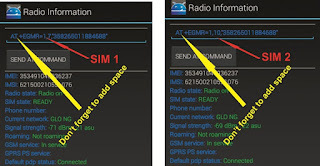 If you use a dual sim phone, you will be given two options here. 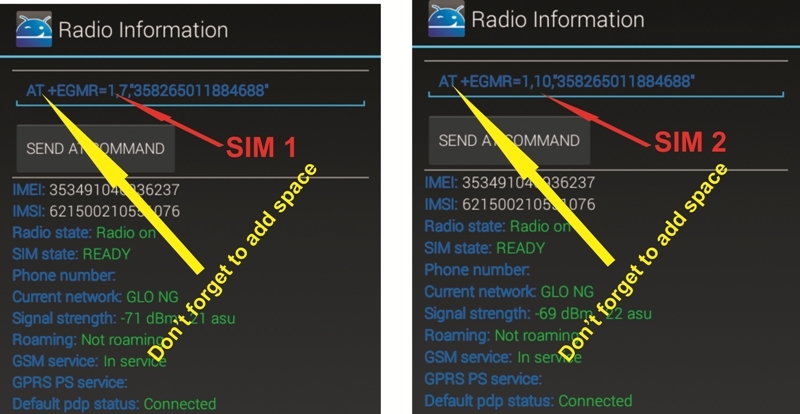 Click the sim port you wish to change the IMEI number. You will see a black screen with some writings. At the top of the page, you will see where it is written 'AT+'. Click the field to edit. Type 'E' and you will see some suggestions. Then type the imei you wish to change into the quotes at the end of the statement. Next ensure you put a space after 'AT' just before the '+EGMR'. Finally, restart your phone. Dial *#06# to confirm if the change was successful.